*Thank you CVS for sponsoring this post. I never thought that I would end up a mommy blogger. But it’s been one of the biggest blessings in my life. I enjoy blogging (when I’m not too stressed out over it), find it an amazing creative outlet, have formed great relationships through the blogging world, and am able to provide monetarily for my family without leaving my house. I also love finding services that make this crazy life easier – like CVS Curbside which I explain more below and have a giveaway for 3 people to win $50 gift cards to CVS to try it out! Or try it out now and get $10 off your first CVS Curbside order (no minimum) with the code CURBPICKUP. One of the most frequent questions I get asked is ‘how did you get into blogging?’ Well it kind of just happened. I started playing around with blogging while procrastinating from studying for one of my very last exams of law school, but didn’t take it seriously at all. I worked hard to go through law school and pass the bar exam, and assumed I would then practice as an attorney for a while before having kids. 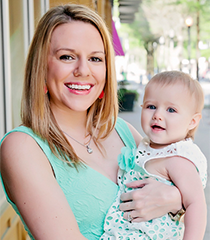 But of course things tend to not go as planned and right after I took the bar exam I found out I was pregnant, and knew that I didn’t want to work the long hours of a law firm when I had a baby, so I figured I would just be a stay at home mom. My mother had also moved to Germany right before I got pregnant and with our family being spread out all over the world wanted a way to keep everyone up to date with what was going on in the life of my family. During pregnancy I began blogging a little more, but still really only a few times a month. After Maddie Grace came I started taking blogging seriously and figuring out what I needed to do to grow a following and also wanted to get free stuff (I didn’t even realize bloggers made money at this point). A house, new cars, a baby… it all added up and financially Tom and I were unsure of how me being a stay at home mom would really work out. Blogging also helped pull me out of new mom loneliness and provided me with an amazing community of other mom bloggers that I could chat with at any time. So long story short I grew to where I am today. I have a medium sized blog, an amazing community of readers and social media followers, and a tribe of other mommy blogger friends whom I love dearly. But it’s definitely not all fun and games. I mean this is real work. At this point I pretty much work full-time but am able to be at home with my children and have the flexibility of setting my own schedule so I can take them to classes and on fun trips, and can choose when and where I do my work. It’s been the perfect option for me and my family. That said I have some long days, late nights, and some days just need a whole lot of caffeine. Since I’m constantly getting asked what I do all day I thought it would be fun to lay it out here, so everyone can see just why I’m always so frazzled. 8:30 AM: Rise and shine! Baby Tripp is always the first to wake up and makes sure I get up with him. Usually I let him lay in bed next to me for a little while and talk with him before his big sister wakes up. 9:00 AM: My little crazy toddler wakes up and is ready to go! Sometimes she wants to play around a little with her brother, and other days she wants to get up and head straight to the kitchen to start her daily eating spree. These morning moments with my two are some of my favorite moments every day. Everyone is in a good mood, and MG is always so loving to her brother. 9:15 AM: Breakfast for everyone. Now that Tripp is starting solids it usually entails me getting Maddie Grace something, feeding Tripp something, and then if I have time to shove something down my own throat I do but too many days that is just not an option. 9:45 AM: Get everyone dressed, teeth brushed, and put on my face. Usually there is a little Sofia the First involved here to help me get us looking somewhat presentable. 10:15 AM: This is the time we leave the house pretty much every day. We either head to the gym for me to workout and the kids to play at the gym childcare that they love, or we head out on a play date to a park, music class, the children’s museum, zoo, etc. 11:30 AM: LUNCHTIME! Whether we are at home or eating lunch with friends after a play date this is one of my favorite times of the day. Tripp takes a short nap somewhere in here too. 12:00 PM: Downtime. I try not to pull out the computer too much during the day because I don’t want all the kids’ memories to be me typing away but generally I spend around 30 minutes replying to emails at this point. 1:00 PM: Outside or craft time. We love to get outside and run around in the back, or even go to the neighborhood pool for a quick dip if it isn’t too hot. 2:3o PM: Nap time. Ideally for both kids but most often one or the other goes down first, then wakes up right when the other finally passes out. So it’s kind of a relay some days and ends up lasting a while. But even if one kid is awake this is my time for cleaning up the house, throwing in a load of laundry, grabbing a snack, and if I’m really lucky even sitting down and blogging a little bit. 5:00 PM: Kids up. This becomes our crazy time. Music, crafts, art, singing, dancing – you name it. This is also when I start trying to get pictures ready for the next days’ blog post. Oh and this is when I realize what I am missing for the next days blog post and that I’m out of diapers for Tripp. Eek – better pull up the CVS app and order those craft supplies for curbside pickup because heavens knows that I am not getting out of my car and going into a store with both kids. 5:45 PM: Arrive at CVS and grab my supplies. Realize that a kid had a poopy diaper explosion in the back seat and ask the nice man who brings me my supplies if I can also get him to grab me some wipes and send him in with my credit card and he happily agrees to while I change the kid in the trunk of my car. Oy. 6:00 PM: Craft time at home. Quickly work on craft and photograph. The best time to photograph in our house is always around 6:00 over the summer so I plan accordingly. 6:45 PM: Daddy is home! YAY! As happy as the kids are to see him, I’m always happier. 7:15 PM: Dinner is served. Lots of nights we sit outside and eat so Maddie Grace can run around and get some energy out. Sometimes we will also do an after dinner walk around the neighborhood or keep playing in the backyard until it gets dark. 7:45 PM: Time for me to get to work! Tom plays with the kids and I start typing away at the computer. I respond to emails, edit pictures, write blog posts, reply to comments, engage with others on social media, schedule content on social media, etc. 8:30 PM: Tripp’s bedtime. I usually nurse him one last time, read him a book or two, and sing a lullabye while I rock him to sleep. It’s a nice blogging break and a special moment for us every night. 9:00 PM: Back to work. Start chugging caffeine if I need to. 10:30 PM: Start begging with a wide awake 2 year old to go to sleep. Play some with her. Read her some books. Brush her hair. Brush her teeth. Read more books. Sing 20 songs. Beg her to go to sleep some more. Give up. Back to work. 11:30 PM: Still working and wondering why 2 year old is jumping all over me and distracting me. 1:30 AM: My sweet, loving, kind, and insanely energetic 2 year old FINALLY passes out. Finally. By this point my caffeine has become wine. So there you have it. This is my life pretty much every single day. It’s not perfect – in fact it’s very stressful most days. But I love it and am so thankful for the time and special moments I get with my children every day. And seriously – thank goodness for CVS Curbside, which I’m pretty sure I couldn’t function without. Here’s how it works: you download the CVS app onto your phone or tablet. Next you simply login and select which store you would like to pick up from. Inside the app you can select what products you’d like to purchase, and pay. You then get a text when your pickup is ready and drive to CVS, park in the designated parking spot, and an employee brings out your purchase when they see you pull up! And because I love for my readers to be able to try out the things that I love, use the code CURBPICKUP for $10 off your first CVS Curbside order, this code has no minimum so you really might as well give it a shot! And I’ve teamed up with CVS to give away not1, not 2, but 3 $50 CVS gift cards because I know pretty much anyone could use one. Entering this one is a little different than my other giveaways: Try out CVS curbside using the code and then simply comment below telling me how your experience was! You have until July 30th to enter and then I will randomly select a winner from the comments – good luck! Your little girl is adorable and like all moms your a busy lady. Thanks for the code. I can so relate to this!! Even though I’m not a mom blogger (more focused on food and fitness) it’s amazing how much WORK is involved! But clearly you have a passion and great niche. Your photos are so clear – I need to take lessons from you! Your life/day sounds so much like mine! It is a lot of work to run a medium+ size blog and still be a hands on mom or working parent. Thank goodness for understanding hubbies, I say. Thank you for sharing your daily experience, Claire! And for hosting a great giveaway!! Thanks for the code! Your littles are so cute! OH my goodness, CVS curbside would have come in handy so many times…the worst when you are out of diapers and are scrounging through every bag you own to find enough to get you through till Daddy is home with more, lol. And your day sounds EXACTLY, I mean down to the times kids wake up and go to bed. I’ve never met someone with kids with the same schedule 🙂 Even nap time. Love it! You have a busy day! Love the curbside concept. This is amazing!! So needed for stay at home and working moms, this is great, thanks for sharing your day! 5pm is crazy time here too! Between late snacks, crazy kids, trying to cook dinner, and everything else! I love your schedule. And I had no idea about the curbside pickup – that’s just awesome! I didn’t know CVS did that! Sounds to me like your day is full 🙂 I am a working mom and a blogger and my day is full as well;) I am going to use that code to try the service out and will let you know! Loved this post! It’s always so interesting to see the schedules of different bloggers. I’m not having children yet, but I’m always curious as to what it would be like to be a mommy blogger, when it’s time for me to transition. So insightful! Wow, that is such a handy service! It’s hard enough getting in and out of the store with one baby – I can’t imagine two (although it’s happening soon)! Totally feel ya on the last-minute, the trying to put myself together, and the family time over computer time. It’s all making it up as I go, but it’s amazing at the same time. The experience was great because it was convenient and reliable. (: LOVE IT! I just tried curbside pickup the other day and I loved it! I didn’t have to haul the kids inside and I wasn’t tempted to buy items I saw in the aisles.